It was inaugurated last January 24 at the Maxxi Museum the photo exhibition Photographs of Life in Khanke Camp, which will be open to the public until January 29. Authors of the shots six girls belonging to the Yazidi community in Sinjar, who are now living in the refugee camp of Khanke (in the Dohuk province). They are called Khawla Shamo, Klood Khedada, Bushra Qasim, Samia Jendo, Manal Barakat, Zina Hassan. A project promoted by UNICEF, in collaboration with the local partners of the Research and Development Organization and funded by the Ministry of Foreign Affairs and the Italian Cooperation. Objective: to provide to a select group of young people, war victims and survivors of acts of gender violence, a tool of expression and an approach to the world of work. The Italian Minister of Defense Roberta Pinotti inaugurated the exhibition together with the President of the MAXXI, Roberta Melandri in the presence of the High Representative of KRG to Italy, Mrs Rezan Kader, the head of the project Mrs. Shayda Hessami, and several military diplomatic and political authorities such as the Chief of the Defence Staff Gen. Claudio Graziano and the Embassy of Iraq. 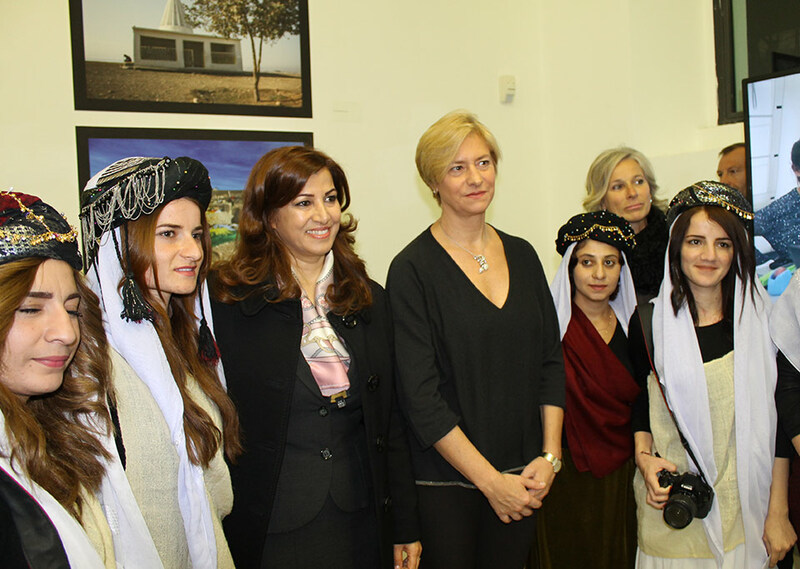 After thanking the project manager, the Iraqi Embassy in Italy and the representation of the Autonomous Region of Iraqi Kurdistan in Italy, Minister Pinotti, described the opening of the exhibition an “important night for photo reporters, to give visibility to the sufferings experienced by the Yazidi people because of violence perpetrated by ISIS terrorists but also to exit from the horror and launch a message of hope, freedom and emancipation”.